We have a new leader in the clubhouse for best meal of the trip. 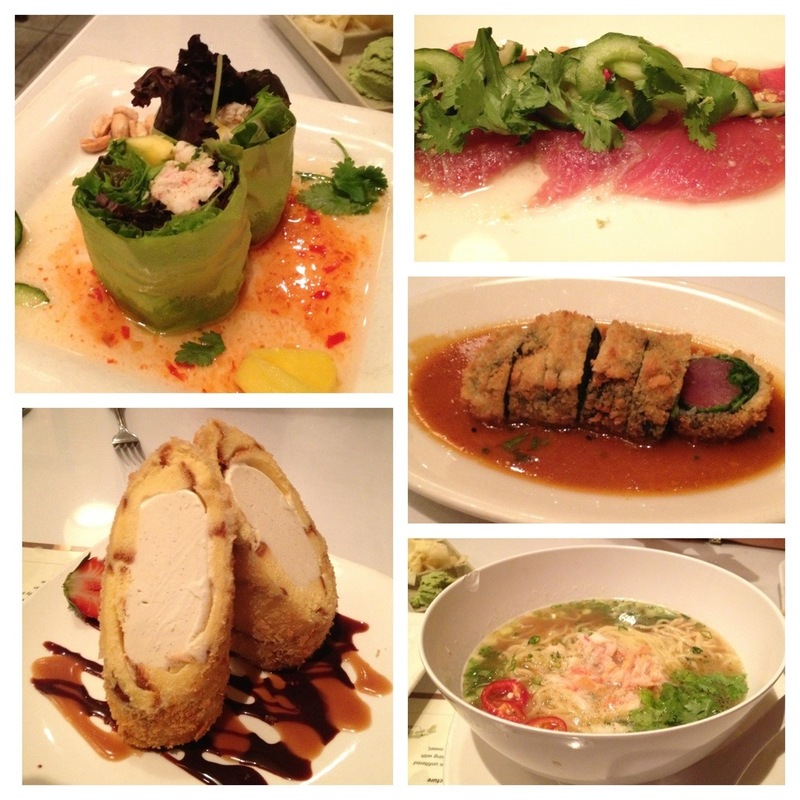 Sansei, right up the street from the Ritz-Carlton was some of the best pan-Asian/sushi we’ve ever had. I was set to order a bunch of nigiri thinking that would be the route to go when in Hawaii, but then I started reading through the batch of specialty dishes they have and I just focused on that. Starting in the upper left and going clockwise here’s what we got: the Mango Crab Salad Hand Roll, the Fresh Hawaiian Ahi Carpaccio, the Panko Crusted Fresh Ahi Sashimi, the Crab Ramen in Asian Truffle Broth, and for dessert, the Flash Fried Ice Cream Wrapped in Pound Cake and Mac Nuts. Gail and I shared everything, each was served in the middle of the table and we just split it up. We ate it at the same pace and enjoyed it together. That’s been the theme for the week, neither of us have ordered just for ourself, which has made every meal better. It was all good, but the Panko Crusted Ahi Sashimi stood out because it was wrapped in arugula which we both love, and the soy wasabi butter sauce was very flavorful. The dessert was especially decadent and passed up the Malasadas from Friday. Unbelievable. Posted in food, tagged vacation-Maui on 2013/04/08 by John.